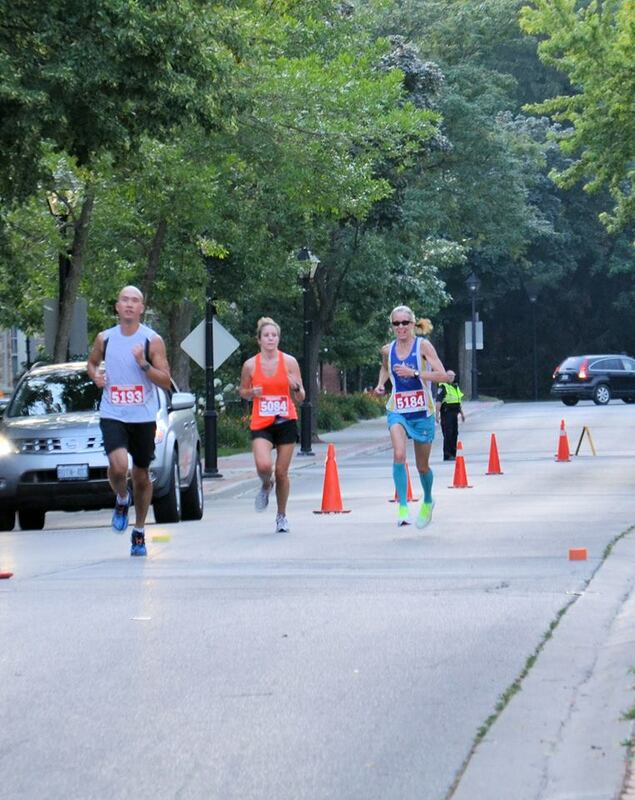 The Downtown Dash: Hot, hot, hot! 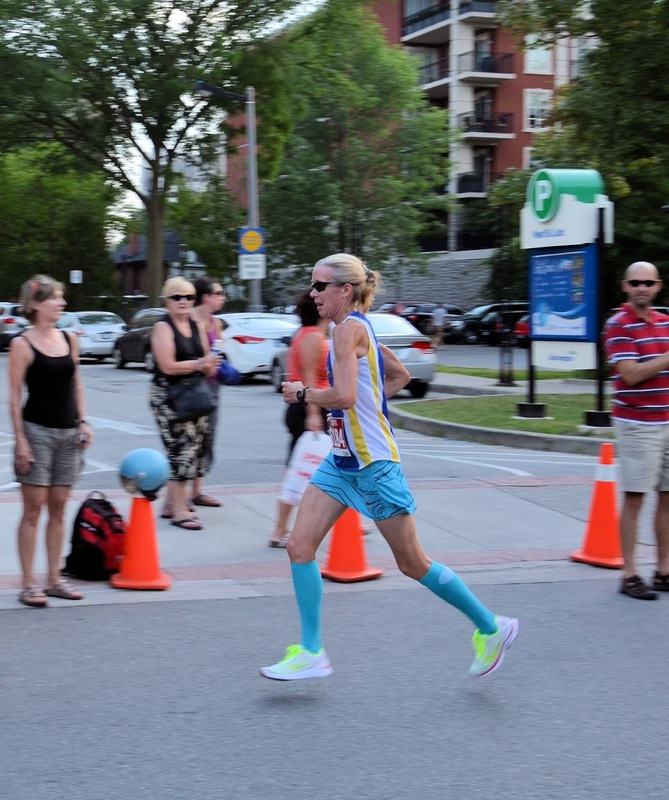 On Thursday night, Darryl and I went to Burlington, Ontario to compete in the Downtown Dash. 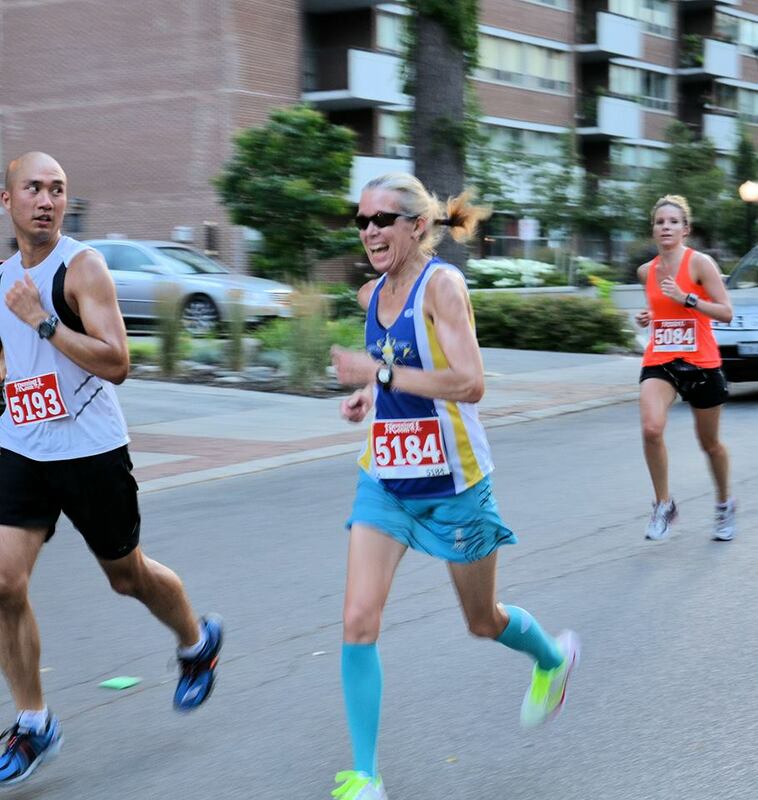 There were two distances at the event: a 5k or a 10K (2 loops of the 5K course); the 10K also doubled as the Ontario Masters Association (OMA) 10K Championship race. Darryl and I both wanted to better our times from last year’s race and we wanted to place. Me, I wanted to run under 44 minutes, which I felt I would be able to do; I also had aspirations of being one of the top 10 women. Mother Nature threw in an extra challenge: the heat wave. Driving out to Burlington, I saw 99F (38C) on a road thermometer. I commented that the only reason it wasn’t showing over 100 was there were only two digits on the thermometer, and there was no indication that it would be any cooler by the start of the race. Hubby Dave was also going to be at the race – but not to run. He was helping a friend promote his company, My Next Race. Dave and two interns from My Next Race were leaving at about the same time, I went with Darryl as I really wanted to focus on the race rather than be sociable and chatty; there would be time for that later. Once Darryl and I picked up our kits, I checked in with Dave and, then, headed indoors to stay cool. About 45 minutes before the race, we went through the warm-up routine – but shorter than usual – and got ready to start. Even though it was so hot, I wore my Running Skirts compression socks, which only felt too warm when I wasn’t running; as long as I was moving, they felt great. World class octogenarian, Ed Whitlock, was also racing the 10K and I was quite excited about that. Our race times are comparable but his 10K is a few minutes faster than mine. On Thursday, I planned to pace myself off him; I was sure that I could stay with him to run a sub-44 10K. The 5K event started 10 minutes before the 10K. Before the 10Kers left, the director announced that if anyone felt the heat was too much, they could stop at anytime. Adding to that, she said that if anyone decided to finish after one loop and not run the second half of 10K, she would create a separate 5K category for those runners. There was no way that I would change distance part way through. For me, it was “go hard or go home” but “hard” was going to be comfortably fast. After passing through the start, Dave yelled at me “pace, pace, pace.” I was ahead of Ed Whitlock and I thought I might be pushing it too much, but my pace felt right. I didn’t feel that I had stormed out the gate and my breathing was fine. So I held it as long as I could. Even though I had spent the week hydrating, I was ready for fuel at the first water station – about 2.5k into the race. There were only 3 people at the station and they were handing out water; I had to get my own Gatorade. I did, but it slowed me down. I had no idea where I was in terms of pacing as I was ahead of Ed Whitlock, nor did I know where I was in terms of position as I was passing 5K runners and walkers. Just before 4K, I decided to use a GU gel. Normally, I wouldn’t need one in a 10K but I wanted to give myself a boost to get through the 6k-8k marks, which are my weakest in the 10K distance. More important, though, was I wanted to make sure that I wasn’t going to end up cramping in the heat and I felt that a GU would help prevent that. Luckily, Coach Kevin was spectating just past the 4K point so I didn’t have to worry about carrying the wrapper until I found a garbage; I just tossed it to him with a “thanks”. I went through the 5k point in a comfortable 22:30. I didn’t want to push it any harder; I was feeling good. I took the advantage of the Gatorade and wet sponges just past that point and carried on. By 6k, one of the spectators told me that I was the third female. I was shocked as I thought there were some faster women ahead of me at the start line. Then, I remembered seeing two of them sitting at the mid-point; they must have pulled out. I felt that I was consistent with my timing and I could see #2; I knew I had to pick up my pace so I did. I lost a few seconds, though, at the water station. Again, it was a “help yourself” affair so I had to slow down, and the gap opened a little more. “Stay cool, Cynthia,” you can catch her. Shortly after, another spectator told me that I was second female; I wasn’t sure whether I caught someone or if another pulled out, but I liked being #2 and I was ready to fight to the finish. The gal ahead must have realized that I was close because she was picking up speed too. This meant that the distance between us stayed fairly consistent. I watched and I waited. “Wait for 8K, wait,” I told myself. At that point, I changed gears and picked it up. And I did. I pulled further ahead and heard cheering from the spectators and from Coach Kevin behind. “You’ve got this, Cynthia!” he yelled. I saw Dave and Darryl and went through the finish in 45:09. With conditions being extreme, I was happy with that. Ed Whitlock, whom I thought was going to be my pace bunny, finished a few minutes behind me. I wasn’t sure, though, if I really was the second female. Kevin said I was second and that the first was only a minute and a half ahead. I was the first Master and that was okay. When the awards began, the race director called the Overall male and Master male first, and then called me. I wasn’t listening carefully and just assumed that I was the first master female. I won beautiful flowers, a gift card to the Running Room and, as top Master, bragging rights of the 10K Championship for the next year. Darryl also won an age group award and an OMA award, but I honestly didn’t pay much attention to the other results; I was tired. A few hours later, when looking at results online, I realized that I was the Overall Female. Only I could mess that up! 1. It’s okay to race in extreme weather. Just modify your pace to meet the conditions. Stay comfortable. 2. Water sponges down your neck and back are way more effective than on your head. 3. It’s always worth the walk over to the results area. Geesh! 4. “Upgrade yourself” has become my favorite phrase, thanks to the creative vocabulary of Little Ironman. That night, I drank a lot of water and I felt fine the next morning. My legs knew that they had raced but they weren’t exhausted – probably because I had run comfortably. I wish that I had a crystal ball to see how my time would translate to a race in “normal” conditions but that just isn’t going to happen. So now I’m keen to find another 10K to get a better idea. For me, who hates the 10K distance, that is a sign of confidence. I guess now, after years of fearing the 10K, I’m feeling ready to tackle it. Congrats on a gutsy race in hard conditions!! Fantastic race! Congrats. And I love your socks 🙂 Actually your whole outfit; I think I have that same skirt and it's one of my favourites. Hey great job! Didn't know you were blogging still, but I'm happy you are!